A field of industrial hemp growing in Farmington. Erica Haywood has high hopes for the proposed 2018 farm bill when it comes to industrial hemp production in Maine. Haywood, along with her husband, Jack, owns and operates LoveGrown Agriculture Research LLC, producing hemp CBD oil, teas and topical products in Farmington. Cannabidiol — also known as CBD — is one of the 60 naturally occurring compounds found in Cannabis and unlike THC — delta-9 tetrahydrocannabinol — CBD is non-psychoactive and does not cause any feelings of getting high if consumed. But under the 2014 f arm b ill still in effect, that distinction does not matter when it comes to federal marijuana law enforcement. But the Senate’s version of the proposed 2018 farm bill includes an amendment that would legalize the production of industrial hemp, which because of its similarity to marijuana, is labeled a controlled substance in the 2014 bill. 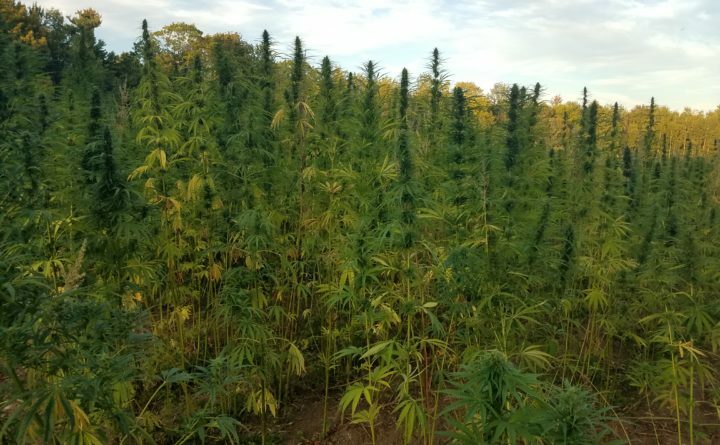 Because hemp is still federally regulated like marijuana, a license from the Maine Department of Agriculture, Conservation and Forestry’s Industrial Hemp Program is required to grow the crop in the state, according to Gary Fish, a state horticulturalist with the department. To legally grow industrial hemp in Maine, the license holder must be part of a state-approved hemp pilot program or part of a research program. In Haywood’s case, her business is licensed as part of a research grant awarded to the University of Farmington. Since the state began the Industrial Hemp Program in 2016, Fish said the number of licensed growers has gone from a single farmer in 2016 to 34 in 2017, with 82 licenses awarded this year. According to the Maine Industrial Hemp Program website, that is the maximum number of licenses available in 2018. Passage of the current farm bill, with the Senate hemp language, would eliminate the need for the licensing and greatly expand the opportunities for industrial hemp cultivation and production in Maine. And that could open up a world of marketing to Maine hemp farmers. The U.S. is the No. 1 importer of industrial hemp, which is used to make paper, textiles, biodegradable plastics, health food and fuel. As a crop, it requires little or no pesticides or herbicides, creates minimal topsoil erosion and grows quickly. When it comes to hemp being a viable crop in Maine, Fish said, the jury is still out. Which is why, pending approval of the 2018 farm bill with the Senate’s hemp language, Haywood is casting her eyes northward. Haywood has already spoken to several Aroostook County potato farmers who expressed interest in growing industrial hemp as a rotation crop. Fish said he has spoken to other licensed hemp growers and plans for the hemp include seed production, extracting the CBD oils, developing construction grade “hempcrete” and producing fiber for rope making. At LoveGrown Agricultural Research, the Haywoods have partnered with the UMaine Farmington researchers in addition to local farmers and other experts to develop certified hemp seed stock and their other hemp-based products. Last year LoveGrown captured 10 percent of the market share of hemp in Maine, with 13 acres in active production. According to a 2014 report by Washington State University’s school of economic sciences, research suggest hemp could be a competitive crop for U.S. farmers. The report references the Hemp Industries Association 2014 data indicating the U.S. spent $581 million in 2013 for industrial hemp-based products including seeds, soaps, lotions, paper, auto parts and building materials.